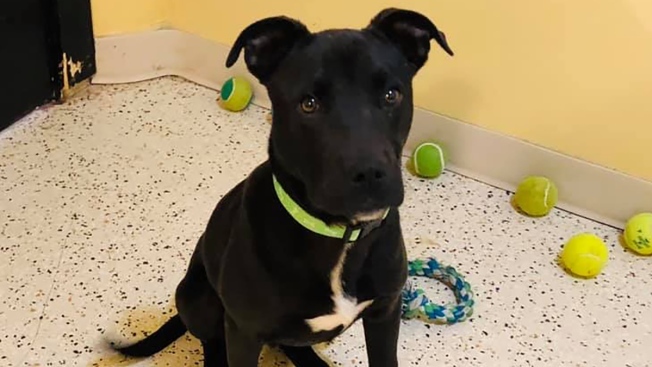 This Jan.16, 2019, Facebook photo shows 7-month-old puppy, Rudolph, at the Kings Harvest Pet Rescue in Davenport, Iowa. Rudolph woke up after being euthanized at another shelter. A 7-month-old mixed pit bull pup named Rudolph, who survived an overcrowded shelter that tried to euthanize him, has found his forever home, an animal shelter official said Tuesday. In a Jan. 16 Facebook post, the Kings Harvest No Kill Pet Rescue Shelter in Davenport, Iowa, described the experience of “this adorable young man” at another shelter. That post has been shared more than 2,000 times. Rochelle Dougall, Kings Harvest Pet Rescue's assistant director, said the shelter partnered with a non-profit rescue organization called Save Our Strays to rescue Rudolph from his previous shelter and transport him to Iowa. Dougall would not name the previous shelter; Kings Harvest often volunteers to take dogs that might be euthanized at other shelters because of overcrowding. Although Dougall said it was the first time her shelter had heard of a euthanized dog waking up, similar cases have occurred with other shelters across the country. In 2018, one Texas dog was left blinded after a failed euthanasia attempt, CBS Austin reported. But the puppy’s calm personality transformed when Davenport residents Joyce Valentine, her 24-year-old son, Mitch, and his best friend entered the shelter on Jan. 18. Valentine said that because she’s a nurse, Rudolph’s traumatic experience “really tugged at [her] heart.” The family has since dubbed the puppy Rudy. Despite the dozens of applications, calls and Facebook messages the shelter received about adopting the dog, Dougall said the decision about Rudolph’s new family really rested with the pup himself. Dougall said the puppy “really lit up and just instantly connected” with Mitch. The shelter also wanted to ensure that Rudolph ended up with a local family, in accordance with the shelter’s adoption contract. Since his adoption, Rudy has even won over Valentine’s 4-year-old rescue pit bull, Thatchet. Valentine said Rudy has already proven to be “such a smart little dog” by learning new commands every day. He’s already learned the hand commands for sit and down.